It's not the usual comment to start a conversation off on a Monday morning. Karen phoned me from the office to say Brent Will, a long-term member of NZDIS, had called to say he would be submitting a claim and could I call him. That seemed a little odd - I'd been speaking to Brent prior to the weekend and there was no hint that he was about to be incapacitated and unable to work. My immediate thought was he must have had some kind of accident but at least he was making the phone call himself so it couldn't be too serious. So, the first question I asked Karen was "What was he claiming for and how long does he think he might be off work?" Karen replied "He has a broken neck - he did it skiing in Japan." Now at this stage I'm really confused and concerned. Brent had been skiing two weeks prior in Japan but I've spoken to him since and he was at work last Wednesday. He didn't go back to Japan in the weekend did he? I needed to speak to Brent. On calling he wasn't his usual positive self and sounded a little weary and worse for wear. It turns out Brent did break his neck in Japan - he was bowled over by an out of control skier in Japan. He was a little dazed by the event but returned to ski the next day and travelled home from Japan on a 12 hour flight including hauling his luggage on and off carousels. He returned to work but the discomfort and headaches prevailed. 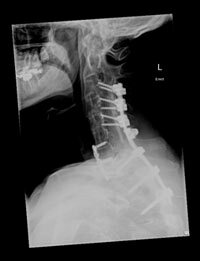 A doctor's appointment on Thursday 23 February led to an immediate hospital admission and complete immobilisation of the neck. It turns out Brent had actually fractured the vertebrae C7. Fortunately there was no damage to the spinal cord. Somehow all of the activities of daily living since the accident had not resulted in causing more damage that could have led to paralysis or in the extreme death. Brent underwent surgery on Thursday 2 March to have a series of pins and plates inserted to stabilise and support his neck. Surgery was successful and his x-ray profile now looks like this. While Brent was convalescing it was important that NZDIS set about looking after his finances. Conversations the week before had centred on a number of changes happening in practice. Just 6 months earlier Brent, in his mid-fifties, was a partner in a well-established North Shore practice of three dentists who had all worked together for over 15 years. The picture was one of "steady as she goes" heading for retirement in the next 10 years. Six months ago that all changed. The lease on the practice premises was not being renewed and one of the partners was selling his practice. So, with the need to find new premises, fit out and relocate as well as establishing a working relationship with a new business partner it was a significantly different picture. There was also now a substantial business loan over the practice. Brent has Disability / Income Protection cover with NZDIS and this is structured to accommodate both his business overheads and personal income. The process at time of claim is not necessarily difficult but does involve co-ordinating a number of parties. Medical information needs to be collected which confirms the incident, treatment and prognosis for recovery. This includes the time frame that his medical attendees confirm he is unable to work. Follow up medical assessments are required to confirm any further absence or programme for returning to work - often on a phased or gradual basis. Brent's claim was as a result of an accident and therefore he is also entitled to ACC payments. So co-ordination with ACC both of the claim acceptance and payments is part of the process. Fortunately for Brent his immediate past business partner was able to come in as a locum to ensure the least disruption to patients. While there is revenue in to the practice there are now the additional costs of the locum. Identifying the actual loss experienced requires the financial records of the practice during this time. Even after ACC payments and locum support his loss of earnings was still significant. Since surgery Brent has made a good recovery and has returned to work part time. Until he is able to resume full time duties he will be on a partial claim and again the financial records of the practice are required to determine the ongoing weekly loss. While the medical reports confirm Brent will make a complete recovery the fact that he mentioned to me he intends returning to the ski fields is probably the best indication of his progress. Brent has been very grateful to have his Disability Income Replacement insurance in place. It is difficult enough dealing with the pain and trauma of an accident. Insurance has made his life easier managing his return to work without having an added financial stress of having to make up a significant earnings shortfall. I'm pleased I work for an organisation that can make a significant difference to its customers and understands their business like no other. Thanks to Brent Will for letting us share his story and image.